THE Mackay property market is continuing to recover with new figures revealing reasonable house price growth in the past year. The latest Real Estate Institute of Queensland Market Monitor found the median house price had increased 2.5 per cent, to $335,000 in June 2018. Unfortunately the unit market remained subdued and dropped 2.5 per cent for the year to $218,000. The report found that Mackay had the smallest amount of stock on the market, which helped increase demand. REIQ CEO Antonia Mercorella said the strength of the job market had supported the recovery of the sales and rental markets in 2018 and that the rental market was going from "strength to strength" with vacancies at a six-year low of 1.9 per cent. Within the Mackay Local Government area there were 222 houses sold in the past quarter and 1282 in the past year. 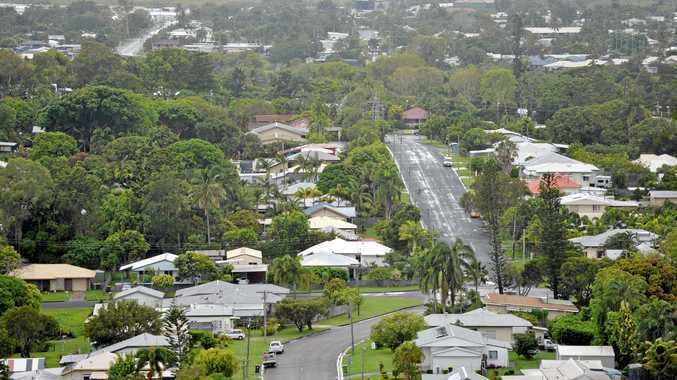 Few suburbs recorded enough sales to obtain a statistically reliable median house price for the quarter, but the best performer in the past 12 months was North Mackay where the median house price increased by 13.2 per cent to $342,000. This was followed by South Mackay and East Mackay where the median increased by 7.4 per cent to $290,000 and $365,000 respectively. Ms Mercorella classified the market as "in recovery". "The prognosis of the unit sales market is still challenging. However, we have noted that the trend of the unit price fall has eased, which could mean that the unit market will soon reach the bottom of the cycle," she said. "The Mackay house market is one of the few markets reporting an increase in sales volumes for the past year. 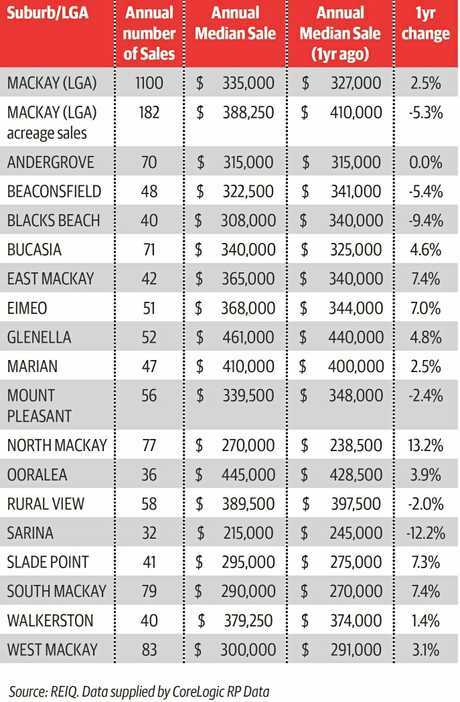 "The suburbs showing the largest annual increase in the volume of sales were Eimeo, East Mackay, Mount Pleasant, Blacks Beach and South Mackay." She said while the unit market remained week, the pace of fall had slowed in the past quarter. "This trend is the result of a more balanced market where supply is falling and demand is increasing," she said. Ms Mercorella said the rental market had improved in the June quarter partially because of increased employment opportunities in the area, particularly in the mining sector. "The outlook for the rental market could strengthen further if Qantas selects Mackay for the proposed (pilot training academy); a move that would bring about 3000 new residents and triggering an increase of housing needs of about 1000 dwellings or 8 per cent of the current rental stock." Ms Mercorella said generally the regional Queensland performance was very patchy at the moment. "Some areas, such as Toowoomba, Mackay, Bundaberg, Fraser Coast and Cairns have performed relatively well," she said. "However, there were some areas where we were expecting to see better results, such as Townsville and Rockhampton. "The local economy in these regions continues to struggle and until employment figures improve it's difficult to see how the housing market can deliver any meaningful growth." Ms Mercorella said Gladstone was probably their most challenged market at the moment. She said the Sunshine Coast was the state's powerhouse market for the 12 months to June, delivering 6.4 per cent growth annually and for the first time had outperformed the Gold Coast, which delivered growth of 4.5 per cent. Ms Mercorella said some regional markets were starting to bounce back from their lows. "Mackay is officially classed as a recovering market (especially for houses), following four quarters of positive growth and this is great news, although prices are still around 20 per cent below levels of five years ago," she said. "This market has probably the lowest unemployment level in the state and the local economy is roaring back to life so it's certainly encouraging and the REIQ is optimistic that it will continue to strengthen, although how far remains to be seen. "Bundaberg, Cairns, Fraser Coast, and Toowoomba are steady markets at the moment and planned infrastructure spending in those markets should help boost the local economy. Hopefully this will translate to house sales." Ms Mercorella said the REIQ had lobbied the government for the first-home buyers grant to be broadened to existing properties in regional Queensland which she thought would definitely give those markets a much needed boost, but there had been no success to date. "It's outrageous that the government is funding additional housing supply in areas of the state that are already oversupplied, through this grant," she said. "Overall, the Sunshine Coast SD, especially Noosa, is the leading market; overtaking the Gold Coast. Noosa has become the most prestige market for houses and units in Queensland. Although it is a small market with only about 30,000 dwellings; it has become a very desirable destination for lifestyle living." Ms Mercorella singled out Mackay (2.5% growth), Bundaberg (2.7% growth) and Cairns (1.2% growth) as the strongest performing regional markets outside the southeast corner. "Mackay is benefiting from a strong resurgence in the mining sector as most engineering firms that service the mines are based in Mackay and this is where a large section of jobs creation has occurred," she said. "Cairns and Bundaberg are diverse economies largely driven by tourism, agriculture and education. "Diverse economies will prove to the most resilient over the long term because the headwinds that can scupper employment in one industry won't impact the entire region. 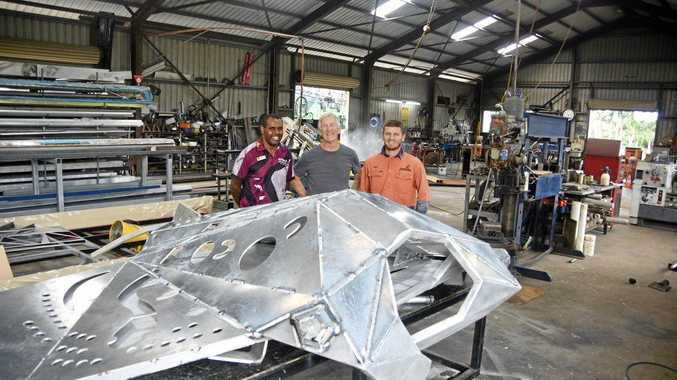 Many of Queensland's regional mayors are working to foster other industries within their regions to diversify the local economy." PROPERTY listings in regional Queensland are already on their way up as the market hits its peak spring selling season. In the six months to July 31, the Mackay region saw 38,702 property views per listing, with Glenella the most popular viewing suburb at 1317 viewings per listing - an increase of 29% from the previous year. Interestingly, Eton saw a 183.3% increase in viewings per listing on the previous year, notching up 697 property viewings over the six months. Other suburbs who saw increases over 100% year on year were Campwin Beach, Mirani, Erakala, Cannon Valley, Scottville and Gargett. REA Group chief economist Nerida Conisbee said spring was traditionally a time when more properties were listed for sale. "In places like regional Queensland, we have seen an uplift in activity and there does seem to be more activity this spring than there was last spring,'' she said. Ms Conisbee said many buyers had an expectation that there would be more properties available on the market during spring and also a number of sellers held on during the winter months to wait until buyers were more active. "A lot of people's properties look a lot better in Spring, you haven't quite hit the heat of summer, where it (your property) can look very dry and that can make homes look very drab. Ms Consibee said regional areas were actually far more positive at the moment than many capital cities and that was a distinct change this spring.